You needn’t be under any illusions with this online slot. Magic Slots has no tricks, just plenty of great bounties, as we found out, when we recently had an in-depth look at this slot. Playtech’s Magic Slots online gambling game is one of the most modern representations of the classic slot machine format. This one armed bandit looking game has state of the art graphics and is very appealing on the eye. 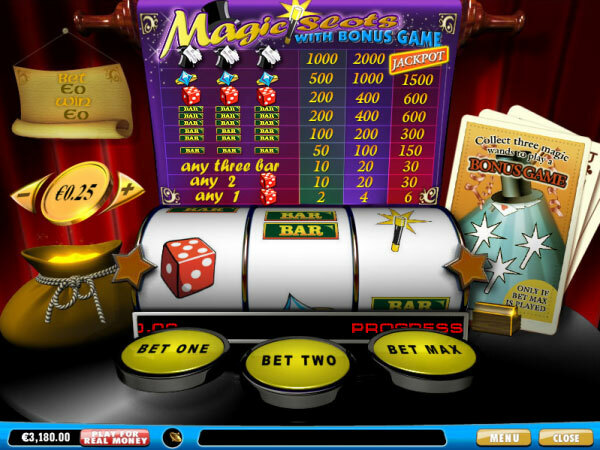 There is surely no such finer representative of the old classic slot games than Magic Slots. Although there is only one pay line on this three reeled simple slot, there is a progressive jackpot. The progressive jackpot in this Magic slots game is worth an estimated 2,000 coins at minimum and can only go higher. In real money this means that you can pocket a cool twenty five thousand dollars or more, with the biggest ever recorded win standing at just over fifty thousand dollars. Naturally with a title such as this, the imagery in this online slot is of a magical theme. Dice, diamonds, magician’s hats, and treble, double and single bars make up the reel symbols. The jackpot can be won when a player bags three magician’s hats on a single pay line, with the maximum wager included. In order to win the progressive jackpot you will need a maximum wager of 15.00 per spin activated on the game. Now of course there are no wild cards, scatter symbols, multipliers or free spin icons but there is, oddly enough, a bonus game. Once you are in the bonus game you are presented with four hats. From these four hats, you must simply pick one to discover what you bonus will be. In order to actually get into the bonus game however, you will need to pay attention to a deck of cards to the right of the reels. These cards count up the number of magic wands that appear during game play. A total of three magic wands is needed to trigger the bonus game.